An image of what is considered an internal U.S. Cellular memo has just been leaked out. It shows a number of phones for the carrier, obviously scheduled for this month. First off, there is the Samsung Axle R311, which is just a basic clamshell with VGA camera and Bluetooth. It should launch June 10. The next one falls under the “Premium” category and is called the LG Tritan UX840. This is a QWERTY side-slider, equipped with a 3-inch QVGA touch-sensitive screen, 3MP camera, full HTML browser and a price tag of about $100. Its interface will not be S-Class 3D, but the one used in the LG Glimmer UX830. Also, have in mind that you will have to sign up for the carrier’s premium data/Internet package for $19.95 per month to get The Tritan. There is also a live photo of the phone, which by the way, is scheduled for launch June 8. 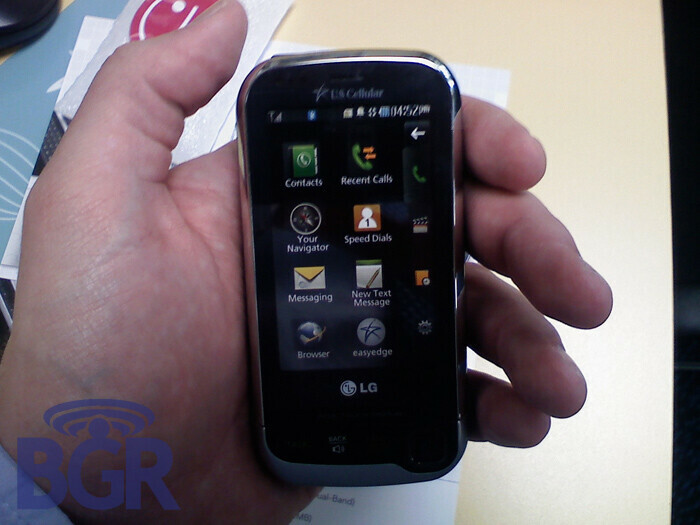 The LG UX700 also sports touch sensitive screen, but lacks the QWERTY keyboard of the Tritan. The display measures 3 inches and other features include 2MP camera and full HTML browser. You will again need to go for the $19.95 data plan to get the device when it comes out in late July or early August. We have two other handsets that are being tested now: the BlackBerry 8230 Pearl Flip and the Samsung Code. 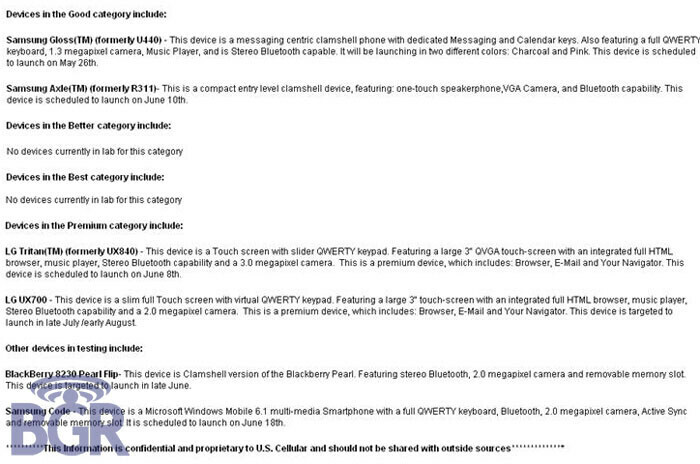 Expect the clamshell Pearl to hit U.S. Cellular stores in late June. As for the Code, it is a Windows Mobile 6.1 smartphone, featuring a QWERTY keyboard and 2MP camera. It should be released June 18.
oh i definately want to pay $20 for non 3g speeds! and that doesnt even include A WEB BROWSER! I really feel sorry for all those who work for US Cellular. As a former employee the company just doesnt get it when it comes to phones. They do EVERYTHING else right, but when it comes to data and phones, they're a complete failure. I loved working for the company, everyone was great, and they treat their employees well.